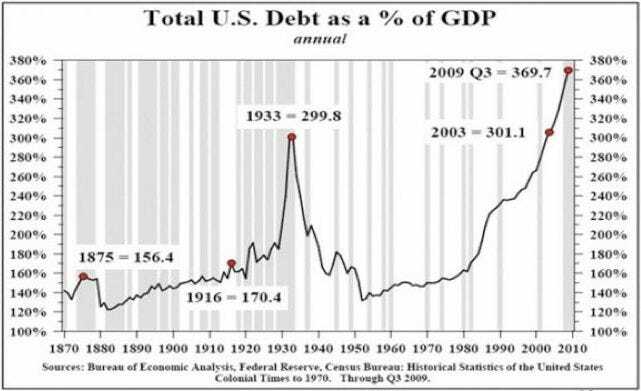 Here’s one of the only economic charts that really matters: Total U.S. debt to GDP (from John Mauldin). This chart shows the trend from the end of the Civil War until now. Maybe it can just keep going up forever? There may be a general upward trend, but there are two clear aberrations: One in the 1920s and early 1930s, and one now. The aberration now is vastly higher than the one in the 1920s and early 1930s, which preceded the Great Depression. Unless “it’s different this time” (unlikely), the second aberration is going to end up the way the first one did–by returning to the mean. How will it return to the mean? 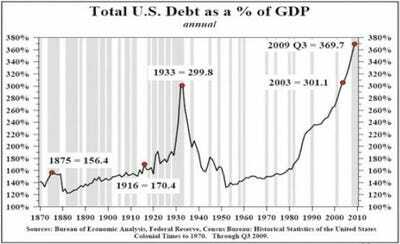 Either we’ll have hyper-inflation with relatively little new borrowing, which will rapidly increase the size of GDP while holding the debt load steady. OR we’ll have gradual growth of GDP combined with a gradual reduction in debt. Neither will be a particularly happy outcome, though the level of unhappiness in each scenario will vary depending on your circumstances. If you have a job and owe a boatload of money, root for hyperinflation: It will make your salary go up fast (in nominal dollars) while your debt load stays the same. If you’ve saved a bunch of money, root for slow growth of GDP and gradual debt deduction: This will preserve the value of your hard-earned savings. In either scenario, though, don’t expect a strong recovery of REAL GDP (inflation adjusted). What has fuelled the rapid GDP growth of the past 25 years has been the borrowing binge that began in the early 1980s (it’s easy to spend and produce more when you borrow more). It’s unlikely that debt-to-GDP can increase forever, especially from this level. So that particularly GDP driver is going away.